Now that May is here and the long, cold winter finally seems to be behind us, we can get back outside in the warmer weather. The Memorial Day holiday is just around the corner, with it bringing the unofficial start of summer. Cookouts and camping trips are common activities, however it is good to remember and acknowledge the reason why we have this holiday. One common way to do that is by displaying a flag. Even if you plan on RVing this Memorial Day, there are ways to still display your flag with pride. There are several options for displaying a flag on a portable flagpole, including hitch mount versions, flagpoles that sit under the tire and ones that stake into the ground. The Flag Pole Buddy Flag Pole Kit actually mounts on your RV ladder. It presents a way to quickly and easily install a flag pole, without the hassle of having to climb the ladder. The flag pole can be extended from 6 feet to 12 when you need a greater height. It can also collapse down when you no longer need it, so it will not take up much space. This flag pole kit can fit flags up to 3 feet by 5 feet, and is tall enough to display more than one flag if you choose. The kit comes with everything that's needed to install and fly an American flag. 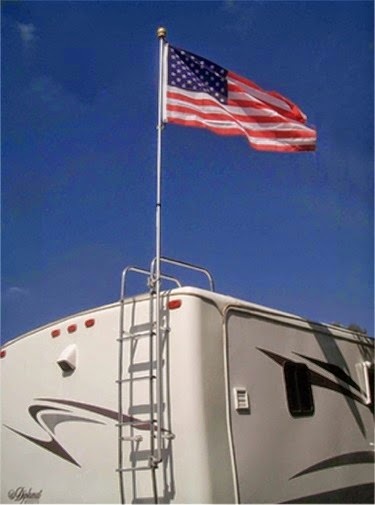 Whether you wish to fly an American or military flag on your RV this Memorial Day, the Flag Pole Buddy Flag Pole Kit will be able to suit your purposes. As a friendly reminder, remember to take the flag pole down once you leave, as they are not made to be used while driving. Other accessories, such as lighted flag pole toppers or extra flag clips are sold separately. Different sizes of Flag Pole Kits include a 1" kit, a 1.5" kit and 2" kit.